Crystal Cruises today said that longtime president and COO Gregg Michel had resigned effective October 15, and he will be replaced by Edie Bornstein. Port Everglades (at Ft. Lauderdale) received $16.5 million in state funds that will enable to the port to complete a couple of projects that will benefit the cruise industry. Carnival Cruise Lines has two ships homeported in New Orleans which are being affected by Tropical Storm Karen. Currently, the Mississippi River is closed and, as a result, the arrivals of both Carnival Elation and Carnival Conquest to New Orleans are expected to be delayed. Guests on board are being kept apprised via announcements and letters delivered to their cabins and are being provided the ability to make complimentary phone calls. Both vessels are sailing a safe and comfortable distance from the storm. Carnival Elation operates four and five-day cruises from New Orleans and departed on its current voyage, a five-day cruise, on Monday, Sept. 30 that included stops in Progreso and Cozumel, Mexico. The ship is presently headed on a northwesterly course to remain behind and west of the storm. The ship, which was originally scheduled to return to New Orleans on Saturday, Oct. 5, will remain at sea, a safe distance from the storm, and await the re-opening of the Mississippi River. Once the river re-opens, it requires a time frame of approximately eight to nine hours to sail up river to New Orleans. Therefore, Carnival Elation is expected to dock in New Orleans on Monday, Oct. 7. The exact time of arrival is dependent on when the river re-opens. Carnival Elation’s next voyage has been modified from a five-day cruise to a three-day Fun Cruise at Sea. Guests who opt to proceed with the cruise will receive a 50 percent refund for this voyage and a 50 percent discount toward a future three to five-day cruise. Carnival Conquest operates seven-day Caribbean and Florida/Bahamas cruises from New Orleans. The ship departed New Orleans on its current voyage on Sunday, Sept. 29 that included stops in Montego Bay, Jamaica; Grand Cayman and Cozumel. The ship is presently headed on a northwesterly course through the Gulf of Mexico and will remain a safe distance from the storm. Carnival Conquest was originally scheduled to return to New Orleans on Sunday, Oct. 6. The ship will remain at sea until the Mississippi River re-opens. Once the river opens, given the necessary eight to nine hour transit time up river, we expect the ship to arrive in New Orleans on Monday, Oct. 7. The exact time of arrival is dependent on when the river re-opens. Carnival Conquest’s next voyage will be modified from a seven-day cruise to a six-day cruise with stops in Key West and Nassau, The Bahamas – two of the three originally scheduled ports. Guests who opt to proceed with this cruise will receive a one-day pro-rated refund. Given the nature of tropical weather systems, the above plans could be further modified depending on the storm’s track, speed and other factors. As always, our foremost priority is on the safety and comfort of our guests and crew. We are closely monitoring the storm, keeping our guests informed and navigating the vessels a safe distance from the weather system. We are also mobilizing a number of additional staff who will join our current team in New Orleans. This will enable us to do everything possible to provide our guests with a high level of assistance and to minimize the inconvenience caused by Tropical Storm Karen. Bermuda’s Parliament approved the Cruise Ship Casino Act of 2013, which will allow cruise ships to open their casinos to passengers during the late night hours when they remain in port. 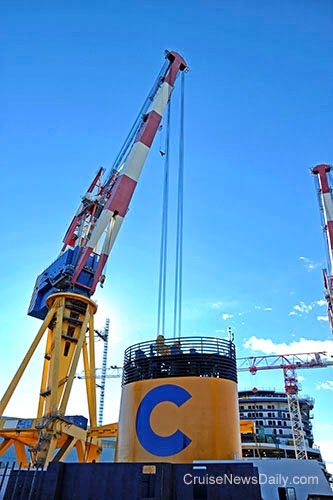 CND subscribers also read about Costa Diadema taking shape (more) ... the Port of New Orleans getting ready for Karen ... a special goodbye from Peter Shanks ... and a familiar voice on The Voice. 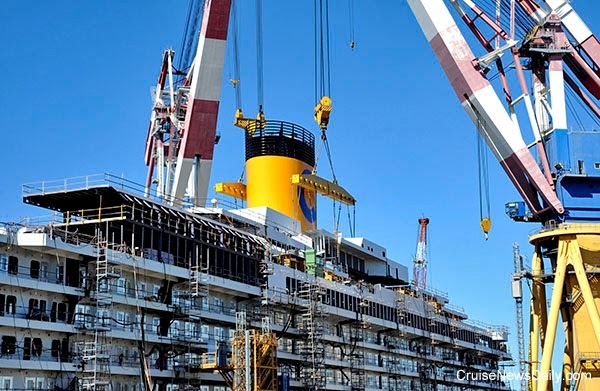 Costa Diadema is under construction for Carnival's Italian brand at the Fincantieri shipyard in Marghera (Italy), and the ship recently passed two symbolic milestones in its construction. 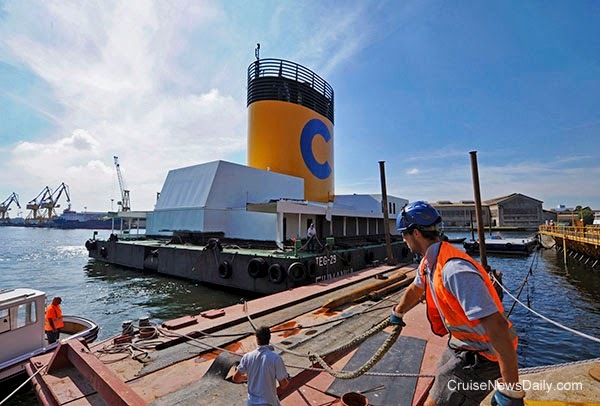 The first was on September 16 (2013) with the delivery and installation of the ship's funnel in Costa's iconic yellow and blue colors. 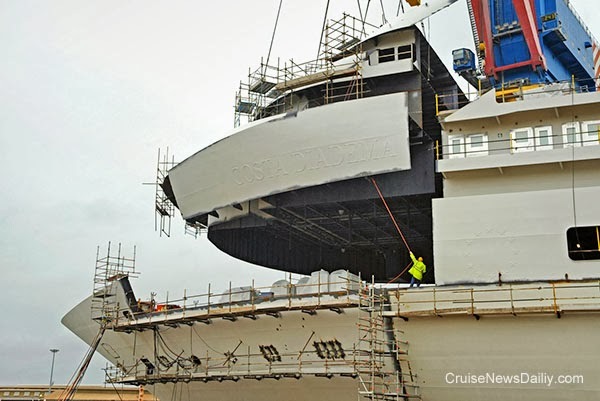 That was followed last week (on September 30) by the installation of the block for the ship's bow which contains the ship's name. 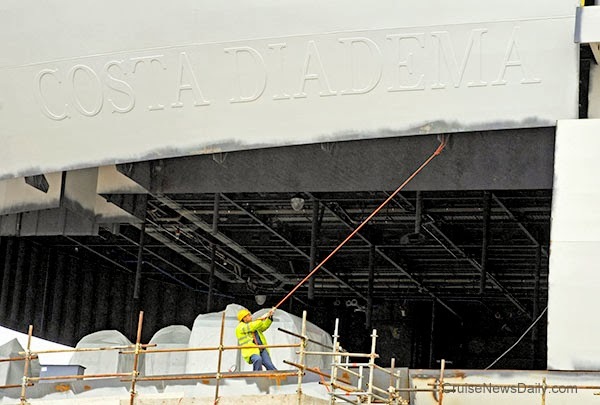 At 132,500 gross tons and carrying 4,947 passengers, Costa Diadema will be the largest ship flying the Italian flag. Delivery is set for October 2014. Unusually strong storms in the Pacific Northwest have caused Holland America to modify the schedules of three ships as they were repositioning southward at the end of the Alaska season. Oosterdam, Westerdam and Statendam all remained in port Sunday night and left at noon on Monday to resume their southbound journeys. The challenge than came in how to handle their late arrivals at the ports in California. Divers have found more human remains alongside the sunken Costa Concordia. CND subscribers also read about Ruby Princess breaking its mooring lines and drifting into the harbor ... Ushuaia warning their local law will be enforced again this year ... and Holland America expanding at Denali. Key West voters today voted not to ask the Army Corps of Engineers to do a study on widening the ship channel into the city’s port. That will eventually limit the port’s ability to receive most cruise ships operating in the Caribbean market. This winter Costa will be sailing a new Emirates itinerary with a newly refurbished ship. The ship will also be new to Costa. That ship is currently sailing as Iberocruceros’ Grand Mistral. By the first of the year, you’ll be able to get something you haven’t been able to get for five years. That’s right; Carnival Cruise Lines is going to start printing their colorful fleet brochures again. The about-face comes at the request of travel agents who told Carnival in an online survey that they find brochures essential to selling the brand. MSC hasn’t really kept it a secret. MSC Divina is coming to Miami year round beginning November 20. Now you could be on the inaugural cruise for free. Hansjoerg Kunze new Vice President Communication & Sustainibility of Costa Crociere S.P.A.
Genoa, September 30th 2013 - Beginning from October 1st, Hansjoerg Kunze will take the responsibility as Vice President Communication & Sustainability of Costa Crociere S.p.A including the brands Costa Crociere, Aida and Iberocruceros. He will replace Mina Piccinini, who has decided to leave the Company for personal reasons. Hansjoerg Kunze, professional journalist, has 9 years of experience in the cruising industry, having joined AIDA Cruises - the leading cruise company in Germany - in 2004 where he currently is Vice President PR & Communication. Kunze’s appointment reflects the strategy of closer cooperation between the different brands of the Costa Group. He reports directly to Michael Thamm, CEO of Costa Crociere S.p.A.
Costa Crociere would like to thank Mina Piccinini for the commitment and professionalism she has demonstrated in enhancing the Company corporate reputation, especially on the occasion of the recent Concordia parbuckling operation and wishes Mina all the best for her personal life and her professional future.